Moments ago, Board President Marty Turek sent an email to D181 families and staff announcing that on May 2 at 5 PM at a special board meeting that will be held at Elm School, the new superintendent will be approved, followed by a light reception. The Board of Education has called a Special meeting for Friday, May 2 at Elm School (5:00 p.m.) for the purpose of approving the hiring of the new superintendent. We are very excited to welcome our new educational leader for District 181! While information about the finalist cannot be provided in advance of the meeting, please be assured that immediately following Board approval on Friday, we will share comprehensive information about this individual’s experience and education, as well as an overview of the Board’s search process. The meeting will be public; any community member is invited to attend. We are planning a light reception after the meeting. A formal “meet and greet” event and celebration will be planned for a future date, along with school visits, and other opportunities to welcome our incoming superintendent. On behalf of the Board of Education, we share our appreciation to all who helped support the search process. We look forward to a strong community partnership as we work together now and for the future of District 181. After five days of reflection on Monday's board meeting, we can best describe it as a roller coaster with a few highs and many lows. The meeting began at 7:20 p.m. and lasted more than three hours. Here is the summary that left us begging to get off the ride. The roller coaster started off at the top of a very steep hill. Everyone in the audience, and those listening in, eagerly waited to hear if the board would start an uphill climb re-establishing itself as a group that expects the very best conduct from its leader, or if it would go downhill and condone and affirm the poor leadership of last year's board president. Sadly, all seven board members took the downhill slope. As predicted, the board officer elections proved once again that the "fix was in." Marty Turek, Jill Vorobiev and Mridu Garg were all reelected to their positions as president, vice president and secretary, without any other board members being nominated. They were elected by "acclimation" which means that because they were uncontested, a vote was not even taken by the board. Individual board members were not given the opportunity to publicly vote Yes or No. Instead, Turek's nominations was simply "affirmed" by Mike Nelson (acting for a brief moment in the meeting as president pro-tem), followed by an affirmation of Garg's and Vorobiev's reelection by Turek, who immediately re-assumed his seat as president. The vote for Turek, therefore, could be considered unanimous. That's right folks. Even the board members that we have come to respect, knowing that they will not support actions that are not in the best interest of our children, and will make decisions that are supported by data, let us down. By re-electing Turek, the seven board members basically told all parents and staff that they approve of Turek's one year reign as a hypocritical bully, leader who has proven over and over again that he will not share all information he receives from the administration with the full board, a leader who has admitted he doesn't necessarily even read board docs materials until he is at his paying job on the same day as a board meeting, and a public official who has called for Freedom of Information Act reform to limit the access of public records by the community. What were they thinking? We can only say that we are beyond disappointed in all seven board members. More $ To be Thrown at Data Analysis? The ride continued on its downhill run as Dawn Benaitis, the Assessment Director, took center stage along with a representative from ECRA -- Educational Consulting Reseaerch Analytics -- a company that D181 is considering purchasing a "student growth model" from. (Click to open Board report on ECRA.) In a nutshell, ECRA will provide online products and services that will enable D181 to track and monitor individual student performance, create a data dashboard and assist in the analysis of the data through the production of reports called "growth scatters." (Click to open ECRA power point presentation.) The board was not asked to approve purchase of the growth model -- that will happen at the 4/28 board meeting -- but learned that it will cost approximately $50,000 per year. Ms. Benaitis explained that the district has spent the last year "cleaning up our data"as they worked with Hinsdale Central High School and other feeder districts to identify a student growth model that could be used as a data cooperative by all of the schools to track student performance data. She admitted that this model will replace another model called PD360. In public comment at the end of the meeting, we learned from a community member that other student data monitoring programs, such as "Just 5 Clicks" were purchased by D181 in the recent past, but that none of these programs have been successfully implemented. It would be interesting to learn how much money has been spent on these past, failed programs. In our opinion, until the current Department of Learning administrators, especially those tasked with analyzing our student assessment data, actually learn how to do their jobs and prove that they are qualified to receive their exorbitant salaries, no additional money should be expended on yet another "student growth model." Dr. Russell has presented student assessment data to the board in the last year, despite the fact that Ms. Benaitis was hired -- purportedly -- to be the Director of Assessment (her title morphed into Director of Learning, but everyone knows that the position was created for then "Mr. Russell" before he was promoted to be the Co-Assistant Superintendent of the Department of Learning and was touted as an assessment position.) Now that Dr. Russell is leaving, Ms. Benaitis has suddenly started presenting at board meetings. Everyone should listen carefully to the podcast of her presentation on Monday night and the answers she gave to board member questions. You will hear that she couldn't even keep track of a two part question, and, in our opinion, her answers were weak, at best. Before any more D181 tax dollars are spent on a "tool" for Benaitis to use, the administration should consider if perhaps money should be spent to hire a qualified, experienced data assessment administrator. After all, there is no point in throwing good money after bad. 4/21 Board Meeting Provides the Opportunity for BOE Members to Establish Credibility with the Community. Will They? The Agenda for Monday's Special Board Meeting has been posted on Board Docs. (Click to open agenda.) The open meeting will begin at 7 p.m. at Elm School following a 6 p.m. Executive Session to discuss personnel. * Listed on the agenda are 3 significant discussion items: election of BOE officers, the Facilities Committee report on Hinsdale Middle School and Dr. Moon's report. Each of these agenda items will afford the BOE an opportunity to prove to the community if they have any interest in re-establishing credibility and accountability. We will briefly review each item in this post, suggesting what we hope the board will focus on. We will report back after Monday's meeting with a summary of the BOE's discussion and actions taken. First up on the agenda is the election of the Board President, Vice President and Secretary. Board Policy 2:110 sets forth the qualifications, term and duties of the board officers. (Click to open 2:110. We have also copied the text of the policy below.) The policy provides for one year terms, sets a limit of two terms for each position and spells out the administrative duties for each officer. The position of President is obviously the one with the most duties, the most important of which include presiding over all meetings, making all board committee appointments, calling special meetings and serving as the board's spokesperson with the media. The Vice President's main duty is to perform the President's duties when he is absent or unable to perform them. The officer positions are currently held by President Marty Turek, Vice President Jill Vorobiev and Secretary Mridu Garg. Between April 2012 and April 2013, Michael Nelson was president and Glenn Yaeger was vice president. Anyone who has attended or listened to past board officer elections knows that "the fix is in" before the organizational meeting even starts. Typically, it is clear that there has been wheeling and dealing outside of board meetings amongst the seven board members that culminates in the nomination of a single candidate by a fellow board member. Then, after no discussion of any kind, a vote is immediately taken affirming the nomination. Rarely is a second board member nominated for a position, but when this has occurred, the candidates are not afforded an opportunity to state why they want to hold the position, before the votes are immediately cast. In such cases where there is a second nomination, you can tell from the body language and facial gestures of the majority of the board that they are just going through the motions of a "contested" election since "the fix is in" and the first vote results in the majority voting for the first candidate nominated, with the second candidate getting at most 2 votes --his/her own vote and that of the person who nominated him/her. So what will happen on Monday night? We hope that this time around, there is a new process followed, whereby whoever wants to serve in an officer position will be nominated, allowed to state their reasons for wanting to be elected, followed by a discussion by the board on each nominee before the votes are cast. Who should be elected to serve as the Board President? To answer that question we need to look at what we've learned about our board members in the last two years. UPDATED POST: Special Board Meetings Called for Friday, April 18 and 19 at 6 p.m. at Elm School and Ruth Lake Country Club -- Possible Conflicts of Interest? 1. According to both agendas, the meetings will begin in open session followed by an opportunity for public comment, then adjourn into executive session. The agendas state that the meetings will be held "at the Administrative Center, 6010 S. Elm St., Burr Ridge, IL. and Ruth Lake, 6200 S. Madison St., Hinsdale, IL." How is it possible for each meeting to be at two locations at once? Will only some of the board members show up at Elm School and some at Ruth Lake Country Club? Will the meetings open at Elm School and then following public comment, will all of the board members drive over to Ruth Lake Country Club? Seems rather unusual to schedule a meeting for two locations. 2. It seems likely that the continuing interviews will be conducted off site at Ruth Lake Country Club, just as the first round were held at the Hyatt Lodge on the McDonald's Campus in Oak Brook. But is it really a good idea to use Ruth Lake Country Club? 3. According to Provision 2 of the School Board Member Code of Conduct, all board members "will avoid any conflict of interest or the appearance of impropriety that could result from my position, and will not use my Board of Education membership for personal gain or publicity." 4. Everyone knows that Board President Turek is a member of Ruth Lake Country Club. Unless Ruth Lake is "comping" the district free use of its facilities to hold these interviews, isn't it a conflict of interest for the interviews to be held at a location at which only a "country club member" is typically allowed to rent out the facilities and purchase food and beverages? Is it possible that the district is paying for the rental fees of these facilities or any food and beverages that will be served during the interview sessions, but that these charges will actually be charged to Mr. Turek's membership account? Is it possible that such charges -- paid for by the district -- will then be credited against the annual amount that Mr. Turek, as a Ruth Lake Country Club member, is required to spend? These are valid questions that should be immediately addressed by the School Board since no Board Member is allowed to benefit financially from their position. Looks like a Freedom of Information Act request might be required in the near future to investigate these possible improprieties. Please post on the blog that there is a special D181 BOE meeting on Monday, April 21 at Elm School at 7 pm. On the agenda is the subject of a new roof for HMS. The D181 Facilities Committee will be recommending the BOE NOT approve a new $2.33 million roof for HMS. Instead, the overwhelming majority of the Facilities Committee recommends that the BOE select Option 1, Patch and Repair. This option is a short-term (up to 5 years) roof solution that will keep the HMS students safe and allow the District to complete research to determine the community's interest in a long-term solution for HMS. The Patch and Repair Option deals with the remaining identified issues at HMS, while allowing the BOE to take informed, research-based action that would have long-term solutions for HMS. In addition, it would also allow time for the new superintendent to be involved in the HMS solution process. It is crucial that the D181 community attend this meeting in order to understand the situation and options for HMS, as well as demonstrate to the BOE the support for a permanent solution to the inadequate HMS building. Thank you." The Facilities Committee is made up of D181 Administrators Schuster, Frisch and Benaitis, Board Members Garg and Clarin, former school board member Ann Mueller, former school board member and Hinsdale trustee Michael Woerner, current and retired D181 teachers and other parents and community members. It will be interesting to read the official "Report" that the committee submits and listen to the live presentation during the meeting. Hopefully the written report will be published on Board Docs over the weekend so all parents and taxpayers can review it prior to the meeting. It will also be interesting to see if the written report aligns with the comment above. We know from past experience and comments made at board meetings from members of other "committees" (Click to open 8/31/13 Post.) that written reports prepared by the administration do not always reflect the understandings of all committee members. Will this be another example of committee members' recommendations being ignored by the administration? We have learned that there has already been dissension expressed about whether this committee should have been a Board Committee versus the Superintendent's Committee that Dr. Schuster insisted it be structured as. Will there be more dissension expressed on Monday? As requested by the author of the comment, please attend the April 21 Special Meeting. Any money spent on HMS now will be an investment in our students' educations and futures. It is important for all taxpayers and parents in D181 to listen carefully to what the committee recommends, since millions spent now on a new roof might negatively impact the community's willingness to fund a new school in the near future, while a short term "patch and repair" option may give everyone the time needed to fully explore and plan for a longer term, state of the art solution in the form of a new middle school. Most importantly, we hope the BOE listens carefully and then fully discusses whatever recommendations are presented. If the recommendations do not match what the comment above represents, we hope the BOE asks each committee member to state publicly on the record what their individual recommendations are. So stay tuned. We will report back on this issue after Monday's meeting. It has been one week since the last public school board meeting. As we all patiently wait for any kind of "word from behind closed doors" on the status of the superintendent search, we thought we would take a few minutes to draw everyone's attention to two issues that we believe the board should address as a group -- publicly -- without further delay, but which the administration seems bound and determined to delay or put off indefinitely. On April 9, 4th grade parents received a letter advising them that next year, when their students are 5th graders, some form of grade level math instruction will be offered. (See below for full text of letter.) The letter stated that due to parent concerns raised this year and the BOE's request to address them, teachers and administrators had met and determined that no changes will be made for this year other than to possibly modify, as needed, the pacing of instruction for some students. At the end of this school year, students will be assessed to determine their placement for 5th grade. We are very concerned about this letter for the following reasons. The administration has successfully avoided allowing the board members to participate in a public discussion where they can address the parent concerns that have been brought to their attention repeatedly since the 2013-2014 academic school year began. The board finally asked for information to be gathered from the teachers in order that they could address the math concerns. Rather than allow the full board to discuss the report publicly, the administration dodged by presenting them with a written report and failing to schedule a discussion on a future board meeting agenda. The letter is no substitute for the public discussion that the entire D181 community should be allowed to listen to and participate in. Moreover, why was the letter only sent to 4th grade parents and not all parents? Why didn't the letter address what is going to be done next fall for this year's 3rd grade students who have started the math compacting/acceleration model? Why didn't the letter address what is going to be done next fall for this year's 2nd grade students when they begin 3rd grade? Will math compacting/acceleration be modified for 3rd, 4th and 5th grades, or just 5th grade? These are but a few of the questions that parents have and that the BOE members should have. These are but a few of the questions that require a public discussion by our elected officials. These are but a few of the questions that Dr. Schuster and the Department of Learning are continuing to avoid publicly addressing. Could it be that Dr. Schuster and Dr. Russell are just trying to "kick the can down the road" until after they leave on June 30? 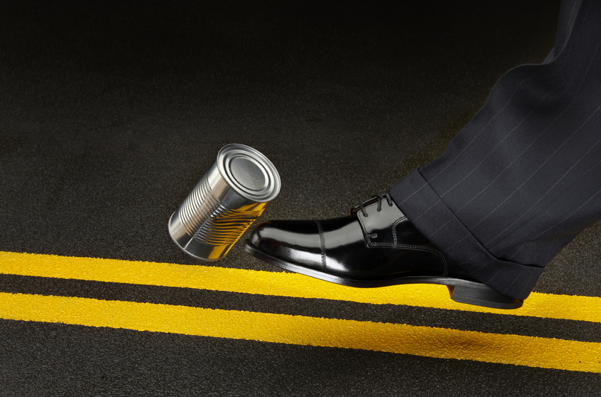 Could it be that Dr. Schneider is trying to "kick the can down the road" because he just doesn't want to answer the tough questions parents and some board members have been asking? What is wrong with the D181 Board of Education members who seem to not care enough to discuss these critical parent concerns publicly? What are they waiting for? Why aren't they demanding that Dr. Schuster schedule a discussion of this important topic on the next board meeting agenda? As everyone knows from an earlier posting on this blog, Dr. Schneider has been riding the "lecture circuit" espousing his social justice philosophy, Learning For All model of instruction, and "non-negotiable principles". During the January 13, 2014 Board Meeting, Board member Heneghan asked for "a verbal explanation of the Non-Negotiable principles discussed by D181 Staff at the TASH Conference" at which Dr. Schneider was presenting. The can was kicked down the road. ""Non-Negotiable Principals for Creating Inclusive Schools for All" (April 25 at Clarendon Hills Public Library, 9:30-11am) and (May 6 at Elm School, 7-8:30pm) This session will focus on the non-negotiable principles that are necessary in order to create proactive, high achieving, inclusive schools for all students. Dr. Kurt Schneider, the Department of Learning, and D181 staff will share research, federal law expectations, and national, state, and local data trends. Time for Q&A will be included. Please RSVP by contacting FRN Parent Liaisons." Fascinating. Neither of these sessions are scheduled during a Committee of the Whole Meeting, as requested by Mr. Heneghan last January. Neither of these are structured as a board meeting, where the full board can discuss -- as a group -- the topic or questions they might have. Will PODCASTS of these sessions be live-streamed or made available to allow parents and community members who cannot attend the meeting -- or even board members who cannot attend those dates and times -- to listen in? Will the sessions actually provide the content of what Dr. Schneider and other D181 staff presented at the TASH conference? Neither of these sessions provide a written explanation of the non-negotiable principles as requested by Mr. Heneghan. Why not? What is so difficult about his request that Dr. Schneider or his assistant could not generate a written response that was actually substantive and not just a delaying tactic? How many more times will the administration kick the can down the road? We close with one more point. Why do people planning to attend either of Dr. Schneider's sessions have to RSVP? Is this a subtle suggestion that if you don't RSVP, you can't show up? That is how some parents will read this announcement, and if their schedule frees up to allow them to attend at the last minute, they may think they cannot attend because they did not RSVP. Such subtle messaging needs to stop. Meetings should be open to all, regardless of an RSVP. This is a PUBLIC SCHOOL DISTRICT, after all! Enough with all of the formalities! Now that spring is officially here and the weather seems to be following suit, we return to you energized and ready to continue reporting on important issues and events taking place in D181. We begin with a recap of Monday night’s Board Meeting* held at Hinsdale Middle School. In our opinion, there were some significant highs and lows during the short, one hour meeting. We begin by thanking the teachers for making two important public comments. On behalf of the faculty and staff at Hinsdale Middle School, a sixth grade Spanish and social studies teacher publicly thanked Principal Ruben Pena for all his work and support during the water and mold crisis. The HMS staff praised Mr. Pena for having "tirelessly worked for the betterment of our building, he shared information in a timely manner and listened and reacted quickly when more water and mold was found. He kept things from escalating, he respected and supported our teachers who were were sick. He took our concerns seriously. He checked in with teachers to see how they were doing. He helped make classes safer and more comfortable during this time. He was on site every day to monitor the cleanup and rebuilding. He helped us to make the best of a poor situation. He deserves credit for all he has done during this situation." We commend the HMS faculty and staff for expressing their thanks to Mr. Pena in such a public manner. It is important to acknowledge such a committed building level administrator, who, along with the teachers, serves our students and community on the front line, day in and day out. Mr. Pena went well beyond the typical Principal's job description when confronted with the water and mold crisis. His commitment to addressing the facilities issues, along with the building engineer Tomas Rios (who has also been commended by staff in a comment submitted to this blog), stands in stark contrast to that shown by some of the upper level central administrators who we won't bother to identify by name in this post. Mr. Pena is one administrator that we are extremely proud of and hope will continue to serve the D181 community for many years to come. Throughout the years of administrative turnover, changes in building and district administration, and the implementation of curriculum and programming initiatives, the teachers "have provided consistency to all of the students who continue to remain our focus." The Everyday Math "textbook is not, and has never been, the district curriculum. Teachers have always had the autonomy in the past to deliver the curriculum, utilizing supplemental resources that they have sought out on their own which they feel support the core content." Teachers feel devalued. "Many teachers do not feel that their professionalism and educational expertise are often trusted and respected at times." "Many teachers do not want to speak up publicly or address the BOE for fear of being publicly criticized or possibly being put under a microscope for others to scrutinize without having or understanding all the facts." Some teachers are afraid to do things differently than what is done at other schools out of concern "that their professional judgment of what works best in their classroom at their school at that moment in time will be criticized or devalued." The adults must practice the concept of "acceptance of other's thoughts, feelings and ideas" that the teachers teach the D181 students. "We do not always have to agree, and quite frankly, will have differing opinions, but there has to be a way to use our shared interest of educating our students to compromise and move forward. Our work with these children is too important to lose a moment on discord amongst adults." Teachers want to work on committees and be involved in the decision making process but "it is very frustrating to offer feedback and expertise only to have it looked over or ignored. If our opinions are truly valued, we hope that a willingness to act on them is taken. We do not want to be labeled as negative or complaining or questioning authority, but we do want to ask questions, get clarification, and offer suggestions." Teachers are in constant need of changing their lesson plans based upon how students respond and this is appropriate and expected. The teachers "would like to see this happen at a district level as well....What we think might work perfectly on paper might not always be realized in practice. Being able to work collaboratively, as we did in regards to the recent math compacting feedback asked of us, we know we can be better together than we could alone." We appreciate the time the HCHTA took to prepare this statement. We believe it is imperative that the teachers, BOE, administration and parents all work together, especially in the area of curriculum, to ensure that every student's academic needs are being met. We believe it is critical that the teacher input not be devalued by any constituency group. We hope that under new administrative leadership, the teachers perspective and suggestions will not be discounted, and that necessary and appropriate curriculum changes can be implemented. According to the speakers, the teacher feedback on the math compacting was submitted to the Board on March 24. Why hasn't it been shared yet with the entire D181 community or publicly discussed by the Board of Education? We are disappointed that this has not been done yet, as time is of the essence and the parent concerns regarding the negative impact of the math acceleration on some students must be addressed as soon as possible in order to make the needed corrections to the program and stop the harm that is currently being caused. We encourage the HCHTA to continue to be vocal on not just this issue, but to speak loud and clear on any other issue that concerns the teachers and has an impact on our students. We hope the administration and Board heed the HCHTA comments and not discount them. We also encourage parents to support the teachers as they continue to work hard to deliver the highest quality education possible for our children. In line with the HCHTA's theme of groups working together collaboratively, there was a brief discussion (of sorts) regarding the Superintendent's Curriculum Committee that is in the process of being formed. As everyone knows by now, Dr. Schuster extended the application deadline to allow more parents to apply. Now she is refusing to give priority to candidates who did apply in a timely manner. (Click to open Schuster's answers to Board Member questions.) During Monday's meeting, she also stated that a request had been made of her to solicit additional Board participation. Board Member Garg was the only one who had volunteered to serve on the committee as of last night's meeting. We found it curious that Dr. Schuster did not identify who had made this request. In our opinion, her desire to add another board member or two, just as her desire to increase the parent pool of applicants, could well be an attempt by her to control who finally is allowed to serve on the committee. Time will tell if the selection process for the parent participants was a legitimate one. Dr. Schuster's solicitation of more board member participation led to the "lowest light" of the evening when Board Members Heneghan and Yaeger got into a heated exchange.